By involving your church, you can transform even more lives through prayer and service. Inspired by the Gospel message of hope, we work with churches from all denominations. Together, we can help build an inclusive world where everyone is loved, valued and accepted – as God intended. Here are some ways that your church, Sunday school, prayer or study group can support CBM. Learn, pray and fundraise with your church to help people See The Way to a brighter future. We have some useful fundraising ideas to inspire you! Why not organise a Dining in the Dark evening or hold a lamplight parade within a service? Until 14th May, every £1 your congregation raises will be doubled by the UK government. For more information on our See The Way appeal click here. 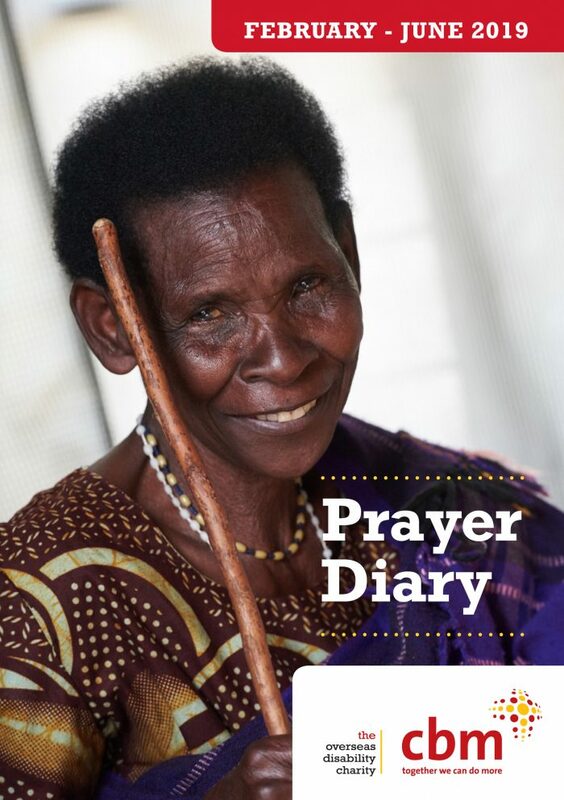 Download our February-June 2019 Prayer Diary or order a free copy of our Prayer Diary by filling in the form here. Our speakers can visit your church or group. Find out why people with disabilities living in developing countries are the world's poorest people, and how our work transforms lives, families and whole communities. Contact Jacqueline Atkinson to arrange a visit. You can help to raise awareness of the issues facing people who are blind or living with other disabilities in the world's poorest communities by using our resources at your church. The following fundraising and awareness resources are all available to download or view online, or you can request free copies by post from Jacqueline Atkinston. Passionate about changing lives? Enjoy organising events or public speaking? CBM uses volunteers around the country as speakers, event organisers and church representatives. To find out more, book a talk or order resources, please contact our Community Officer, Jacqueline Atkinson, on 01223 484700 or using our contact form.